Mark Kirkpatrick and Mountain Construction have been Project Managers for Hearthstone Log & Timber Frame Homes since 1992. As General Contractors, Mountain Construction has worked with many Log and Timber Frame manufacturers over the years, but Hearthstone remains our selected provider. Located in East Tennessee, Hearthstone’s designers, combined with our expertise and your vision, can provide breathtaking Log and Timber Frame home plans from our collection, or from your designer's or architect's plan. Delivering to all fifty states and all over the world, we can work with your general contractor to provide complete Log or Timber Frame home "dry-in" services. 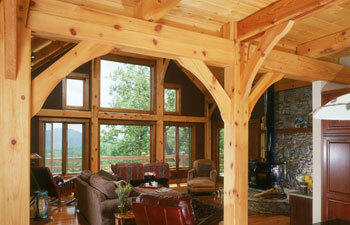 We can provide both Residential and Commercial Log and Timber Frames. We can provide complete homes or timber entries, great rooms, additions, gazebos, garages, pavilions, and other structures. We can provide as many or as few timbers you require. With Decades of Leadership in all Things Timber, Hearthstone is dedicated to making available to the public what we believe in: Traditional custom American-made products of uncommon character. Our products are rich with a magical aura and a quiet dignity that makes eyes widen, imaginations spin, and people realize that pride, respect, and craftsmanship still exist in the American marketplace. 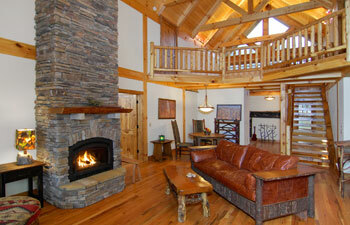 Hearthstone's full service design staff provides full construction drawings for all of the homes they produce. We have developed a great respect for the technical expertise of the Hearthstone Homes design and management team. We are very familiar with the Log and Timber Frame industry and believe in Hearthstone's motto: The World's Finest Log & Timber Frame Homes. Hearthstone is very competitive with their pricing when the full extent of their product inclusion outline is evaluated. When considering a Log or Timber Frame Company, please evaluate their product inclusions and service outline fully. It is very important to know exactly what is provided with a Log, Timber Frame or Timber Trace™ (Structural Panel) home package. Hearthstone's basic package consists of Timber Frame or Log walls, rafters, beams, girders, porch timbers, special slotted jambs, spline system, hardware and roof sheathing installed.. 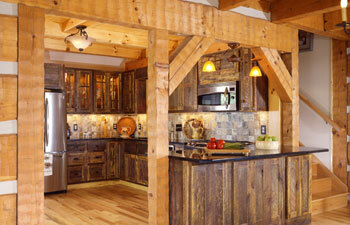 Essentially, this constitutes the Log or Timber Frame skeleton of the home. On some models, conventional trusses replace Log roof systems. You need to provide foundations, stonework, sub-floor, and all facets of the completion of the house beyond the timber frame or log framework such as heating and electrical systems, cabinetry, floor covering, plumbing, etc. There are no special foundation requirements. They are the same as conventional construction foundation specifications. In many instances we can offer contractor services, recommend contractors or assist you in finding a contractor yourself. Four full sets of working blueprints OR shop drawings of your designer or architect plan are provided with each standard house sold. There is an opportunity for one mark up set of plans before plans are finalized. Purchasers of custom home packages receive a floor plan, foundation plan and all elevations with a window schedule, porches, patios and other necessary building details. 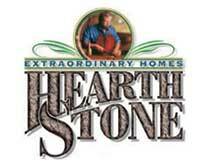 Hearthstone provides skilled crews to install all of their Home Packages. We erect the Log or Timber Frame skeleton on your existing, custom-installed foundation and sub floor. We will provide Assembly Services anywhere we sell a home or commercial structure. The investment is modest compared to the value of our trained, professional staff and assembly crew.